We had a wonderful two days at Snowgums. We loved the apartment - very spacious, with everything we needed. Pippa, Becky, the puppies and the cat were all great hosts and so welcoming. Briancon will definitely be on our recommended list of 'must visit' destinations, and Snowgums the place to stay. Could not recommend Snowgums highly enough. Boy, were we lucky to find this place! At the center, but off the road and away from crowds. We came to hike, and Pippa was the perfect guide - where to go for a variety of scenery, what were the best trails – even pointing us to a side trail through wildflower meadows instead of a far less dramatic main trail – as well as lending us the needed jackets, hats & gloves when we weren't prepared for the cooler weather. Pippa lives downstairs from the apartment we rented, and chatting with her at the end of the day (and getting advice for the next day) added a personal touch to our accommodations. A simply wonderful week, in large part due to this house and our host! Pippa was really prompt in her replies when making initial enquiries and on booking sent helpful information. On arrival she was warm and welcoming and gave us a gorgeous selection of food local produce. The property has everything you need and great bike storage. There is a wonderful back garden with fantastic views of the mountains. Pippa guided us to find the best locations to eat and hike; which gave us some local knowledge. There is something for everyone here-beautiful views for those that just want to look and for those that want to be active the best mountain and road biking, hikes, swimming and kayaking. We stayed for two weeks and wanted more time to explore so many other treasures that this area has to offer. We came for the Alps, the mountains and the biking, but what we found was much better - the two of you! What a joy to have been able - no lucky! - to experience the welcoming atmosphere you have created at Snowgums. We hate to leave, but wait, we get to come back in two weeks! Yahoo! Thank you Pippa and Becky. All the puppies were such a bonus! We had a brilliant time at Snowgums, intended to stay for three nights but ended up staying the whole week as we loved it so much. The apartment had everything we needed and the huge garden with mountains surrounding was the perfect place to relax in the evenings. We stayed here with our baby daughter and Pippa, the owner, provided us with everything we needed for our daughter, including a really thoughtful selection of toys. Pippa and her daughter make excellent hosts, friendly and helpful without being invasive. Pippa knows the area really well so this is a great choice for anyone new to the Alps wanting a bit of help getting to know it. A beautiful apartment in a beautiful part of the world, highly recommended! My 5 year old son and I had a truly wonderful time at Snowgums. The accommodation within Pippa and Becky's beautifully renovated farmhouse is homely, authentic and practical. The love, thought and huge amounts of energy and determination it has taken to create 'Snowgums' has achieved a unique and very special holiday retreat. Pippa's knowledge of the area is bountiful and even without a car we were able to experience some of the activities on offer, namely the ski-ing. Five minutes walk down the road to the bus stop. Free 10 minute bus ride to the ski slope and buses running regularly on the half hour. Fantastic! This was my first visit to the Alps and my eyes were opened to a stunning and soul warming place. It was such a magical time spent in Pippa and Becky's beautiful home and taking in the breath taking views and clean air. I feel truly uplifted by the experience. We will be back for sure! The Briancon area is a beautiful network of valleys high up in the Alps, with easy access to the peaks and the glaciers. In summer, there are hundreds of beautiful walks, from a gentle saunter along river or meadow to several days' treks from one refuge to another without ever using a road, as well as climbs and bike tracks galore. 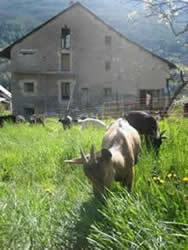 In winter, excellent transport to the Serre Chevalier ski area. Snowgums is a big old farmhouse, a short walk from the town. Spacious inside with a big garden to relax in. Our week in September was mostly hot and sunny and we had some spectacular walks and sights. Hope we can come back for more! Thank you for your hospitality, your wonderful house, the comfiest beds, and all the practical help and advice. Hope to see you again! Pippa has done a fabulous job of converting this old farmhouse into three beautiful apartments which retain their rustic charm. It is in a great location on the bus route between the beautiful historic town of Briancon and the Chantermerle ski centre serving the extensive Ser Chevalier ski area. Pippa has been a delightful host, warm, friendly and very helpful. We enjoyed our stay so much that we plan to return again in March and possibly also in the summer with friends since there is so much to do in the valley both in summer and winter. Later.....Coming in September the weather was fabulous warm and bright in the day and comfortably cool at night...a great relief after coming up from the sweltering heat of the South coast. Pippa was, as always, a fabulous host and with her extensive knowledge of walks and hikes in the area was able to provide us with an itinerary which left us eager to discover what each day had in store. The scenery was breathtaking and surprisingly varied within easy driving distance from Briancon. I was also pleasantly surprised to find the mountains so verdant with bubbling brooks of clear mountain water accompanying us on every walk and an abundance of wild flowers and butterflies, not to mention the elusive Marmots scampering about the hillsides. Briancon market must be one of the best I have been to with wonderful food stalls and some great clothing and artifacts and it was a delight to experience the beautiful old town in the summer sun and sit in the square soaking up the atmosphere. I can also recommend a visit to the baths at Monetier les bains for a very special bathing experience!...a latter day Roman baths. All in all I can thoroughly recommend a visit to Briancon in September and there is nowhere I would rather stay than Snowgums. We spent a fantastic two weeks at Snowgums and would definitely recommend it to others. The owner, Pippa, couldn't have been more welcoming and her knowledge of the area was really helpful as she came up with lots of suggestions for beautiful places to go hiking. The apartment was very comfortable and full of character and came with access to a lovely walled garden, which was great for sitting out in the evening with a beer! There is plenty to do in the area - we spent most of our time hiking but the thermal spa in Monetier is well worth a visit and Briancon itself is also lovely. Great place to stay in a fantastic region. Pippa was able to provide us with current information about open roads and recommend good hikes and walks. The apartment was fantastic with good views. My spouse spent many an hour sitting on the window ledge reading and reflecting. The room set up and bathroom gave us plenty of space. The bed was very comfortable. Overall this was a highlight of our nearly 6 weeks in France. We'd been to Serre Chevalier before and really liked it, but this time we managed to stay for a bit longer. Perhaps because it is slightly further away from the main airports in the area, it's managed to retain a bit more of its local charm. The apartment was great. We needed to do a bit of work while we were away, and there was adequate wifi and plenty of table space to set up our laptops. Halfway through the week a couple of friends joined us and there was certainly plenty of space for the four of us. The kitchen was well equipped and we felt completely at home in the place. We are snowboarders and had a brilliant time on the slopes - there were no queues, the sno-park is a lot of fun, and there are lots of places to go off-piste. The owner was really friendly and made us feel very welcome. The property is full of character with a large garden and plenty of toys if you have children. It's in a quiet rural setting, so don't expect local services right on your doorstep, but with good access to other towns and villages by bus you won't have any difficulty getting what you need. The owner has a wealth of knowledge about possible trips to mountains, thermal pools and the beautiful old town of Briancon. The views to the mountains are spectacular and the skiing is really extensive in winter, with cross country skiing and ski touring available if you get bored with miles of pistes. Very warm and welcoming owner of the properties - very helpful pre-visit information available and lots of good local knowledge. The rooms have lots of character, with everything you need, and there is a rustic charm about the place. Well located - around 5 - 10 min to ski lifts and shopping. Serre Chevalier is not overly developed and the combination of great range of skiing with often deserted pistes and rarity of queues make it a bit of a find! We plan to come back again. We loved our stay here so much we are already planning a return trip. Pippa and her daughter Becky were welcoming and made us feel at home the minute we arrived. Becky even brought chewy bones for our dogs and I am sure they would have been happy to have spent more time out in the snow with Becky's dog Chine had we not been so busy exploring the local area and trying out the Ski Nordique in the nearby Vallée de Clarée. The accommodation is charming, clean, well equiped and warm despite the minus temperatures outside. Don't miss out on a visit the the thermal baths at Montier les Bains swimming outside at night in the snow is amazing and an experience never to forget! Our second stay at Snowgums lived up to our wonderful memories of our first. Pippa has created a delightful space in a lovely area which has lots to do without being too manufactured like some ski areas. We travelled as a couple with a small girl (9) and an adult friend. Our apartment was just right - so peaceful. We relaxed quickly and took in the thermal baths, skiing, the old town, Vallee du Claree, ate and drank well, explored the small villages and just walked in the snowy atmosphere. If you are not familiar with the area, you must try it. The facilities are great for cooking and eating in and there are plenty of eating out options if you fancy. We used the cook in chef Nathalie for two meals including a stupendous Christmas dinner and would highly recommend at least one meal from her - delicious! 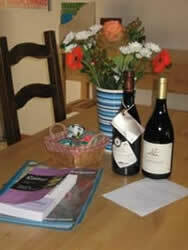 Pippa and Becky are delightful hosts who make you feel more than welcome and were born to hospitality. I'd recommend Snowgums to couples for a romantic stay or families looking for quality time together. My family of four had a great week here. Plenty to do (more than we expected). Particularly enjoyed the glacier; walk and picnic up the valley; wandering round the old town and the lovely open/covered swimming pool. Holiday a hit with our pre teen girls. 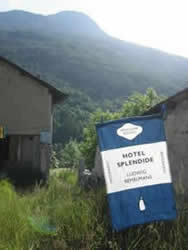 Accommodation is lovely, old surroundings but all mod cons. Loved the bright touches to soft furnishings. Warm welcome and helpful tips from Pippa and Becky.